Oh, what a time it was, recently venturing back to the groovy 60s era. The legend of Warhol mixed with whiskey to provide a cocktail of fun called, well, Warhol & Whiskey…as over 250 Austin business and community leaders gathered for an exclusive preview of the Blanton Museum of Art’s newest cool exhibition, Warhol By the Book. We love a great party and this was indeed one to remember. 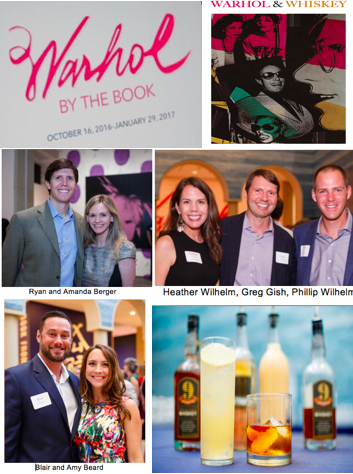 Guests sipped drinks from 9 Banded Whiskey, savored light bites, listened to live music, took pop-up tours of the exhibition, had poems created for them from Typewriter Rodeo, as well as other artfully-inspired activities. One the scene were Blanton Board Champions Janet and Wilson Allen, Tamara and Charles Dorrance, Stacy and Joel Hock, as well as Kathleen Irvin Loughlin and Christopher Loughlin. The host committee included Evan Baehr, Samantha and Stuart Bernstein, Laura Gottesman, Gerardo Interiano, Callie Jenschke, Meagan McCoy Jones, Jerri Kunz. Rob and Elizabeth Rogers, Alejandro Ruelas, and Phillip Wilhelm.